An effective customer messaging platform can help with marketing efforts — turning customers into brand advocates — and can save your customer support managers from wasting hours with unqualified or routine customer questions. Ideally, the customer messaging platform will have a chatbot that takes over lead qualification and handles the initial conversation about customer support needs, helping delight your customers and freeing up time, effort and money in customer support expenses. Let’s take a look at Drift. Drift markets itself as “the leading conversational marketing platform.” Designed to qualify leads, the chatbot makes quick work of the process, ensuring that sales reps don’t waste time on poor prospects, but invest their energies on top-quality leads. That emphasis on inbound lead generation pairs well with the platform’s lead nurturing features, clarifying the path to the sale. Add in the customer support system, and you’ve got a comprehensive front-end CRM solution. Drift’s clients currently include around 50,000 companies. Excellent capture of inbound leads: With Drift, companies can instantly reach out to prospects in real time. Thanks to the available features, there’s also immense potential for nurturing leads effectively and answering customer questions quickly. Quicker sales process: According to an article by Forbes staff writer Alex Conrad, “One customer generated $600,000 to its sales pipeline in just its first two hours using the software.” Drift can take a customer conversion process that might span two weeks and reduce that time to a few days or less. Superb support: Users can count on top-notch support from the Drift team, during the setup phase and throughout implementation and use. Support techs are happy to help companies perfect their chatbot conversations. Widespread integration: Drift works well with a variety of other marketing tools, and the platform continues to build out new integrations and improve current functions. High cost: The expense of licensing for Drift is a turnoff for some potential users. To get on board, companies have to be sure that there will be enough of a return on investment to justify the initial financial output, which can be anywhere from $300 to over $4,000 depending on the desired features. Too much upselling pressure: I’ve heard it from clients using Drift, and TrustRadius users report that the platform constantly pushes for them to upgrade their usage to the next level. The continuous upselling can be annoying for users. A few bugs: Users report occasional issues with exporting conversations smoothly or receiving notifications instantly. Drift gets high marks for inbound lead generation and lead nurturing options, as well as for support and overall ease-of-use. While the platform also gains points for superior integration options, it loses points for the integrations and notification features being buggy and for the high cost, which may be prohibitive to its target market — small to mid-sized businesses. For small businesses that need an effective support solution for their customers, or that require a faster way to work with a large number of inbound leads, Drift could be the right solution. If you’re looking to start conversations with prospects more quickly, address customer issues instantly, and collect additional data for CRM use, consider implementing Drift. Let’s take a look at Intercom. 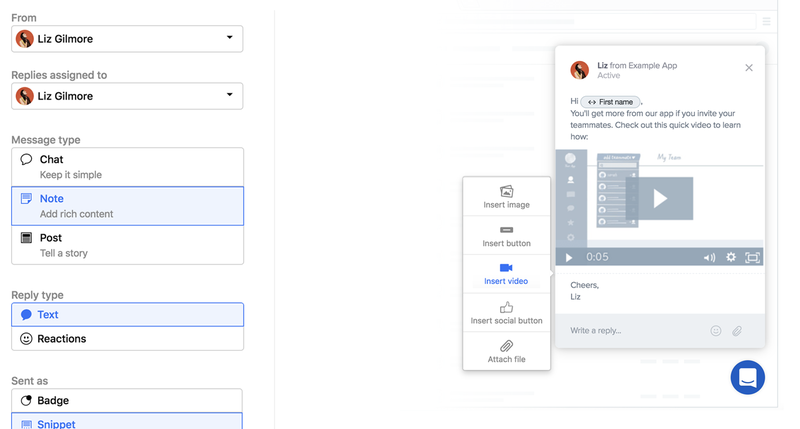 Intercom claims that it offers “a new and better way to acquire, engage, and retain customers.” Serving as more than just a chatbot, it covers the three key areas of lead acquisition, customer engagement, and customer support/retention. Customization and personalization: Users praise the flexibility and customization options within Intercom. Its agility enables businesses of any size or structure to tailor the function to their needs. Plus, customer service representatives or sales agents can customize their personas and build better relationships with prospects and customers. Effective chat service: With Intercom’s chatbot, companies can reach inbound leads swiftly while cutting down on customer service reps’ phone time. The customer service team can focus on the best leads, while still offering consistent support to current customers and helpful information to new ones. Multi-use potential: Intercom includes features that are useful throughout the business, not just in the area of chatbot services for customer support or lead generation. Customer relationships and retention, lead re-assignment, CRM strategies — the platform is useful for all that and more. Analytics: When I’ve used Intercom with clients, I’ve been surprised about the lack of ability to yield more detailed reports. The platform collects helpful data, but doesn’t offer advanced filters in the analytics dashboard. Pricing: Intercom’s prices start at $49 for messages, with additional monthly costs for Intercom Inbox or Intercom Articles. As a company’s contact volume increases, so does the price of Intercom. Essentially, you pay for what you use. Companies have to continue evaluating ROI to ensure that the benefits outweigh the cost. 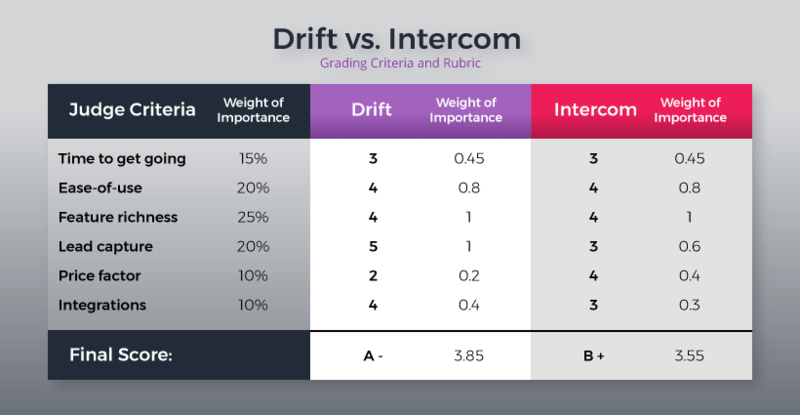 Like Drift, Intercom scores high for versatility, usability, and customization. It fulfills its role as a chatbot, managing new leads and supporting current customers. In the area of integration options, and analytics, it loses a little of its advantage; and the pricing can become unexpectedly high as a company’s contact volume grows. For small or medium-sized businesses, Intercom accomplishes everything it’s designed to do, and more. 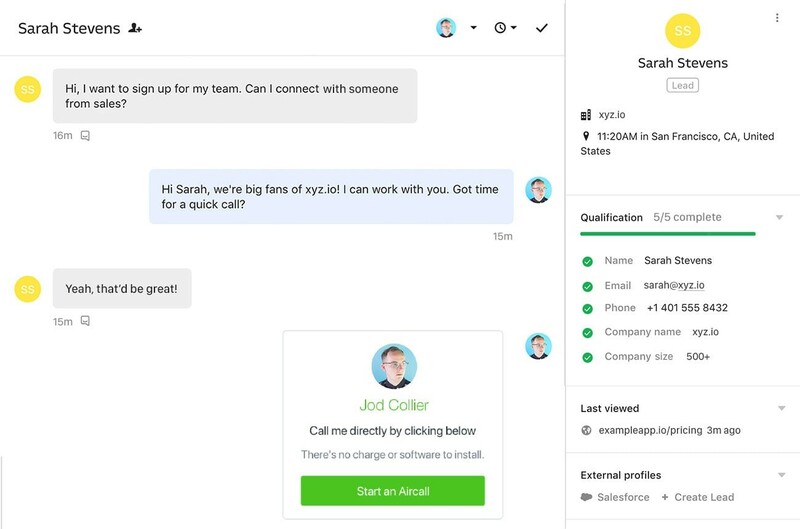 With a mobile app, a help center, message customization, user targeting, conversation tagging, and product walkthrough templates, Intercom offers a broad variety of helpful tools for any customer service or CRM department. The platform can also help you segment your customers to increase your marketing reach. As you can see, both of these products are excellent in their own way, and I don’t think you’ll go wrong with either of them. While I love how innovative Drift is with new product offerings, Intercom has a long history of providing good software with robust functionality. To remove potential bias, I independently weighed the main aspects of each customer messaging solution and then compared the numbers to see how they stacked up against one another. The results give Drift a slight edge for the win. Where to learn more about Drift and Intercom? To check out Drift, watch the video about the platform for more details or try their test drive option. Intercom also offers a free demo and a 14-day free trial if you’re interested in that platform for your business. If you’re new to using chatbots in your business, check out this earlier article I wrote on “6 New Ways to Use Chatbots and Automated Marketing in 2018” for tips on getting started. With a well-designed customer messaging platform at the front-end of your customer service process, you’ll enjoy better lead management, improved sales, happier customers (that are more likely to turn into advocates), and bigger profits for your company.